Saws, air saws, pneumatic panel saws, trimmers, flush cut trimmers, gel coat notch trimmer. 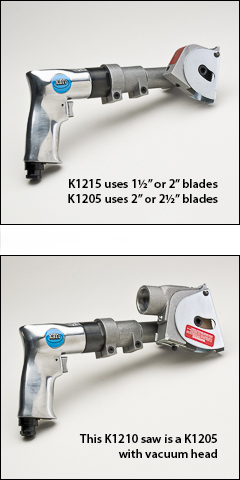 Trimmers and saws listed below use blades with either a 7/16", 1/2", 3/4", or 0.868 center hole. 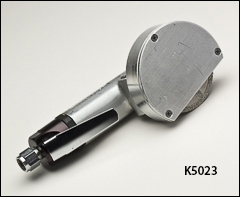 Except the K5023F flush cut trimmer, which has a 1/4" collet and uses blades with a 1/4" spindle shank. Cut-off tools are also available, if you prefer the cutting blade perpendicular to the body of the tool. Additional saws are shown on our Saws, trimmers page. Please see the Saw blades page for a selection of circular blades for saws listed below. SAFETY WARNING: Make sure the RPM of the saw or trimmer you choose below, does not exceed (is less than) the maximum RPM of any accessories you use with that tool. Bodi powerful lightweight machine fitted with a closed dust guard, 1.00 HP. Works best with thin parts under 1/16" and on smaller compressors. 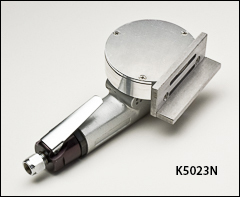 Includes F5218 3" blade; a thinner blade good for fast cutting with this smaller motor. 3/4" arbor, 16-18 CFM, 90 PSI, 1/4" air inlet, 3/8" min hose size, 8.5" long. Bodi same motor as on K5023 trimmer listed above, but with a 3" mounted blade with 1/4" spindle shank (F5037A) to cut flush or cut confined areas where larger saws won't fit. Works best on smaller compressors with parts under 1/16". 1/4" collet, 16-18 CFM @ 90 PSI, 1/4" air inlet, 3/8" min hose size, 9" long. Bodi unique tool notches gel coat only. Stop stress cracks in gel coat caused by guard rail screws. Base preset with 3/4" offset fence. Steel base won't wear from rough edges. Blade set to 0.020" depth of cut. Includes a F5118 3" blade. 3/4" arbor, 16-18 CFM @ 90 PSI, 1/4" air inlet, 3/8" min hose size, 9" long. Diatrim 20,000 RPM air trimmer is light and powerful. Designed to fit into hard to reach spaces. Useful for those restricted to using smaller air compressors. Trimmer includes two F5105 continuous rim diamond blades: 2" diameter, 1/16" edge thickness, 1/4" arbor hole, 0.30" maximum cutting depth. This trimmer can also use the thicker 3/32" F5106 blades. Both are shown on our Diamond edge circular blades page. 1/4" arbor, 13.5 CFM @ 90 PSI, 1/4" air inlet, 3/8" min hose size. 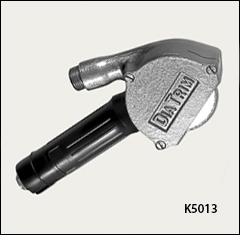 Diatrim 12,000 RPM air trimmer is light and powerful. Recommended for trimming smaller and thinner parts. Used by those restricted to using smaller air compressors. Dust extractor guard included. Trimmer includes two F5215 side spoked blades: 3" diameter, 1/16" edge thickness, 1/4" arbor hole, 1/2" maximum cutting depth. This trimmer can also use the thicker 3/32" F5216 blade. Both of these are shown on our Diamond edge circular blades page. 1/2" arbor, 19 CFM @ 90 PSI, 1/4" air inlet, 3/8" min hose size, 10" long. 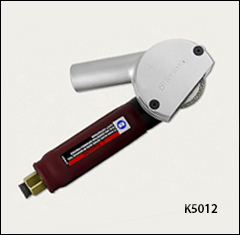 Kett highly maneuverable saws with positive stop depth adjustment for precise depth of cut. 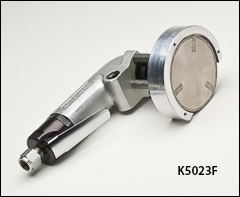 The variable speed trigger lets you make smooth starting cuts in mild steel up to 16 gauge. A plastic cutting blade will quickly cut through hard or soft plastics without chipping or burring edges. Maximum cutting depths: 5/16" with 1 3/4" blade, 3/8" with 2" blade, and 5/8" with 2 1/2" blade. Please note the 7/16" arbor on these three saws. 7/16" arbor, 4 CFM @ 90 PSI, 1/4" air inlet, 13 1/2" long. Steel tooth circular blades are shown on our Circular blades with teeth page. Carbide grit edge circular blades are also available for these saws.